To save desktop icon layout means to save desktop icons, which show cabinets, files, folders, and various types of documents (that is, letters, reports, pictures) and icons’ position on the Windows desktop. You have your desktop well organized? You enjoy customizing desktop icon layout, such as placing system icons on the left side and favorites at the top right or creating different pictures made of icons? Most likely you do. Certainly you don’t want to lose icon positions. Such loss may be caused by other users’ actions, Windows moving your icons around, system fail and more. Proper positioning of icons on the desktop plays very important role for users who have lots of icons. Certainly it is useful to know how to save desktop icon layout, but icons’ content is much more important than a location. With Handy Backup you can back up desktop to any place you want and be sure that your files are protected. Download Handy Backup on your computer. 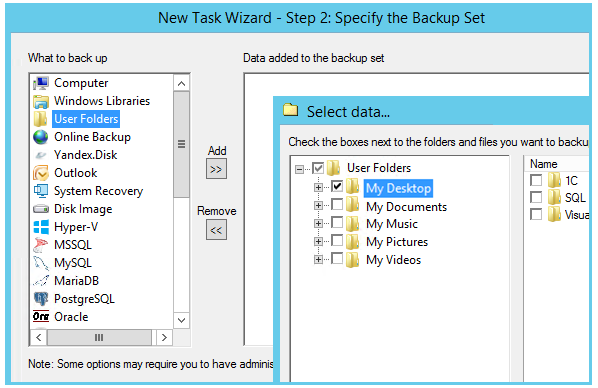 From three types of tasks select to create a backup. For desktop backup there is already an option for choosing desktop. You just click ‘User Folders’ and then ‘My Desktop’ instead of choosing particular folders one by one. Now all your desktop data is carried on a USB, local hard drives, other memory device, across a network, or wherever you choose. The glossary contains 178 terms. The current section Data for Backup contains 11 terms.